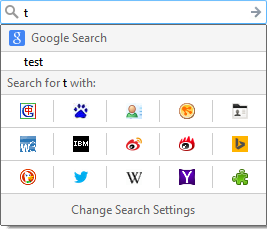 The latest Firefox 34 shipped with a revised search bar design. To be honest, I don’t like it because I need to change the default search engine from time to time and do not want to click my preferred search engine every time I search. This entry was posted on Monday, January 5th, 2015 at 3:46 pm	and is filed under 技术. You can follow any responses to this entry through the RSS 2.0 feed. You can skip to the end and leave a response. Pinging is currently not allowed.